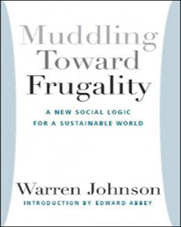 Mr. Johnson’s thesis can be summarized without much difficulty: after generations of extravagant and reckless industrial expansion, we are clearly entering an age of economic scarcity. While human demands continue to rise, natural resources, especially the non-renewable kind, become harder to find and more expensive to extract, process, transport and distribute. This simple brute fact is the basic cause of inflation, despite the inability of most professional economists to see it. (The “dismal science” has never been more dismally obtuse than it is today.) The law of diminishing returns is coming into effect. Technological developments can delay the process but not halt or reverse it; nor can we rely on government or big business to save us. Planning for further growth delays the adjustments that must be made, makes a fair sharing of necessary sacrifices more troublesome, and if carried too far will make more severe and painful, because rapid, the inevitable decline of the international economic machine. The best way to deal with the end of affluence is to accept it—not fight it—and to begin, here and now, the unavoidable adaptations, on an individual, family, and community basis. Piecemeal, experimental, and muddling.